British military officials have held talks with their counterparts in Moscow over "incursions" of Russian aircraft around the UK, the defence secretary has said. Michael Fallon said the talks aimed to find ways of heading off any "miscalculation or accident". Russia has not crossed into UK airspace but has flown close to the boundary. Last month Typhoon jets were scrambled from RAF Lossiemouth to intercept two Russian planes over the Atlantic. 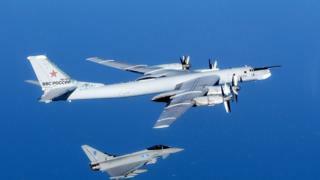 The Russian Tu-160 Blackjack bombers were escorted by the RAF until they were clear of the "British area of interest". A similar incident took place over the North Sea in October, while Russian "Bear" strategic bombers were intercepted on several occasions by the RAF earlier in the year and in 2014. Speaking at the Atlantic Council think tank in the US, Mr Fallon confirmed: "There have been discussions with Russia about setting up some means of avoiding any miscalculation with its long-range aviation. "These aircraft have not been responding to communications from air traffic control, or indeed signals from the planes we send up to intercept them."